Enjoy a warmer pool every day of the year. No planning ahead. Just pure pleasure. Solar pool heaters are passive. No operating costs. Use your existing pool pump and filter! The #1 reason people don’t use their pool is the operating cost and hassle of using a traditional heater. Complete this form and we will contact you with more information about how solar pool heating can work for you! Solar pool heating is a specialized area of solar energy that utilizes purpose-built solar panels to absorb heat from solar radiation. Solar pool heating panels are black in color and made from polymer material, the blend of which is proprietary to each manufacturer. If you drive around virtually any community in Florida, you will start to notice many homes with large black panels on the roof. Those are solar pool heating systems. 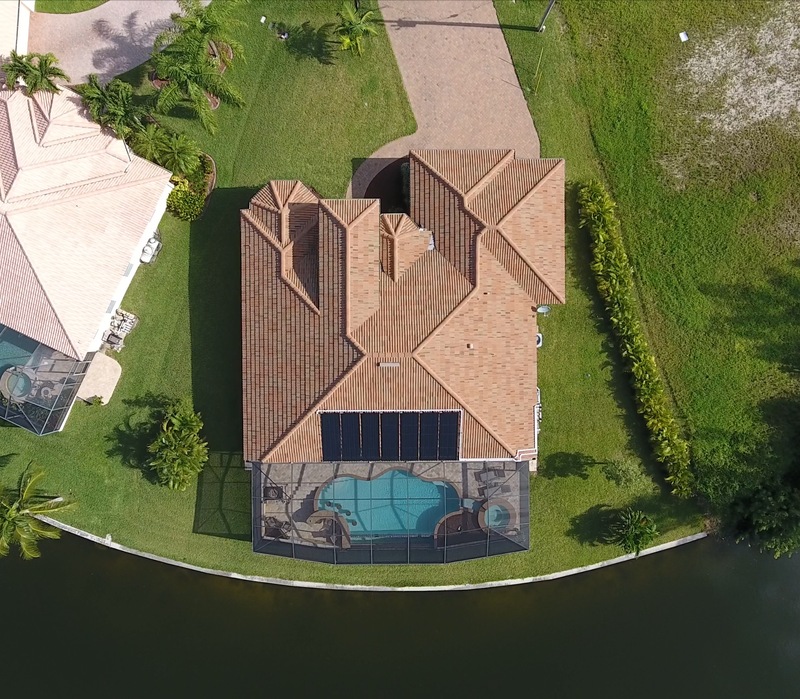 Solar heat for pools is extremely popular in Southwest Florida. In fact, we are one of the top markets in the country for this type of solar panel. There is no electricity involved. Pool water actually flows through the solar collectors, absorbing heat along the way. These systems use your existing pool pump and works with virtually any existing pool equipment. 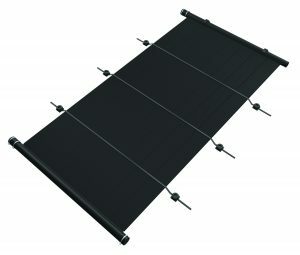 How Do Solar Pool Heaters Work? 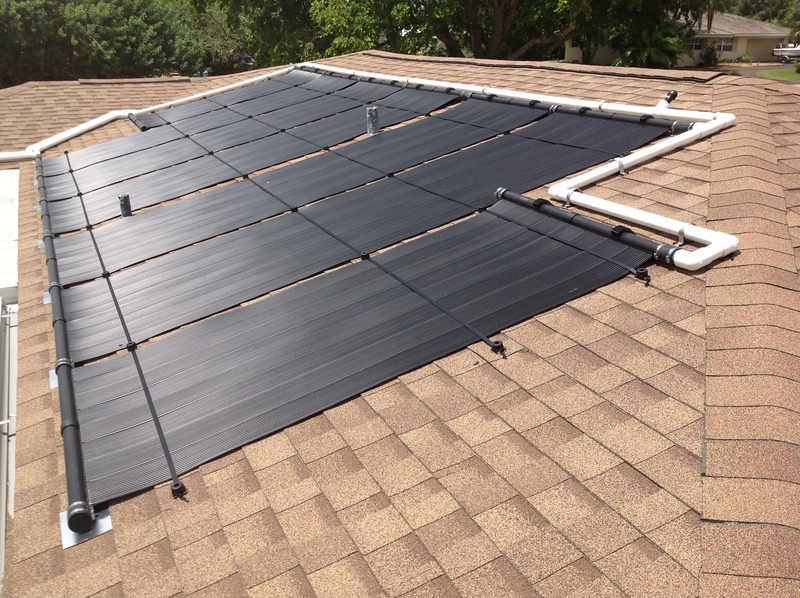 Solar pool heaters work by sending water from the pool through solar panels using your existing pool pump. Pool water is redirected to the solar panels in order to absorb solar radiation in specially designed solar collectors. See our interactive graphic below to learn more about how solar pool heating panels work. Start enjoying your pool and stop worrying about heating costs! 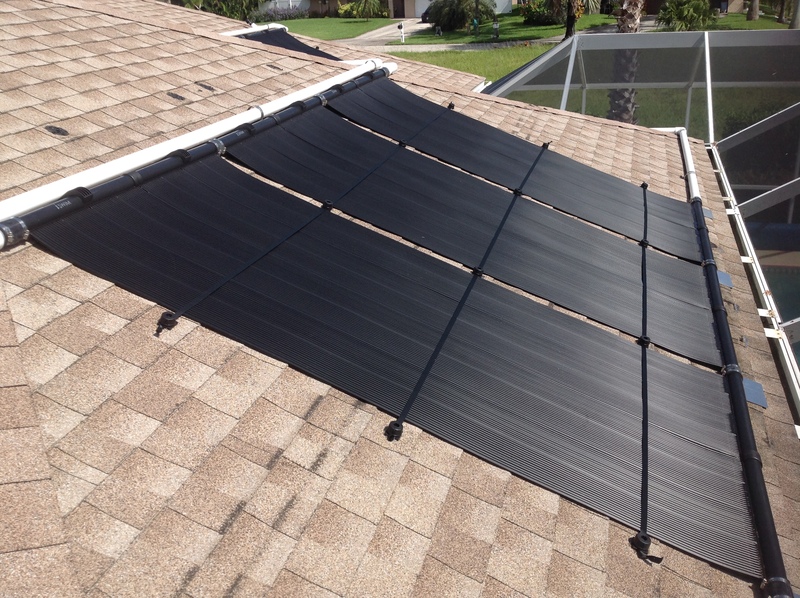 Florida Solar Design Group is Southwest Florida’s exclusive iSwim Solar Pool Heating system dealer. 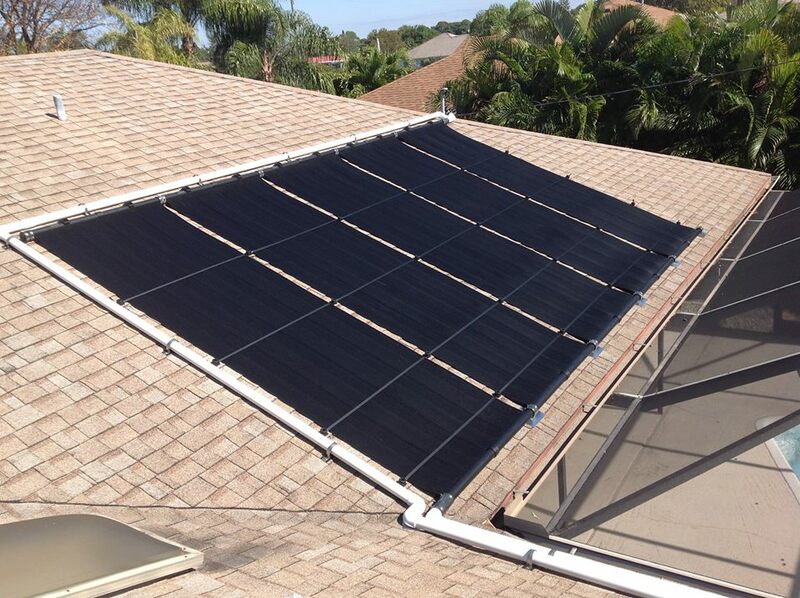 Solar pool heating panels use your existing pool pump (in most cases), and result in no additional electricity costs. With no operating costs, solar pool heating remains the most popular way to heat a pool in Florida, and can save thousands in energy costs compared to electric heat pumps or gas heaters. Solar pool heating is weather dependent, but will result in temperatures well above that of an unheated pool every day. Solar pool heaters provide a fantastic return on investment for home or commercial use when compared to traditional heat sources. They also provide an improved quality of life at an affordable price, allowing you to enjoy your pool more — in some cases year-round! When asked about their pool solar heating experience, pool owners say that they use their swimming pool more often, enjoy it more when swimming, and feel their pool is a better investment. The number one reason for buyer’s remorse with swimming pools is not using it often enough due to cold water. Why have a swimming pool if you never want to use it?! If you have ever left a garden hose in the driveway on a sunny day, you know how hot water can get. This solar thermal principal is applied to solar pool heating panels that are specially designed to absorb a maximum amount of solar radiation and to transfer that energy to your pool water in the form of heat. Because pool water constantly flows through the solar panels, your pool water is constantly heated when solar energy is available. We often call the swimming pool “the most expensive room in your house,” as it often is. For just a small fraction of the cost of a pool, you can enjoy luxuriously warm water with no ongoing heating costs. For an independent look at how solar pool heaters work, see the Energy.gov website. 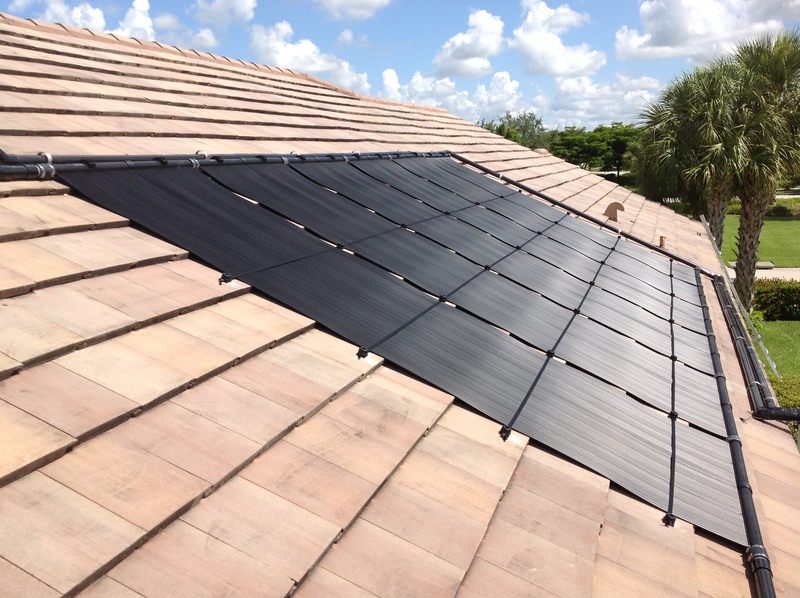 If you want to learn more about solar pool heating, contact the Florida Solar Design Group at (239) 491-8010 today.